The Ruth Northcott Memorial Lecture is sponsored by the RASC. It is held biennially (in odd-numbered years), usually after the Awards Banquet at the General Assembly. Selection of the speaker is made by the President of the Society and the Chair of the local organizing committee hosting the General Assembly. The speaker is expected to submit the lecture for publication in the Journal of the RASC within three months of the lecture. The General Assembly Organizing Committee shall have the responsibility for the local arrangements, including the publicity through the local media. Additionally, publicity is sent to local educational institutions, science clubs, libraries, etc., and to neighbouring Centres of the RASC, with the request that an announcement of the lecture be posted and/or included in their newsletters or notices. 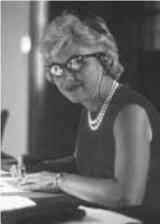 Read about the life and work of Ruth Northcott: JRASC (63) 225 | JRASC (73) 64. View all images and documents on rasc.ca related to Ruth Northcott. Bibliography of Ruth Northcott's writing for JRASC.